Toshiba makes an enormous number of laptop models exclusively for business use. The Tecra systems are just a small part of its business-oriented range, focused on those on the move who need a powerful platform that they can transport easily. There are four subdivisions to the Tecra series: A, Z, W and X types, the latter of which is the subject of this review. And, within just the X40-D-10 range there are F, G, H, J, R and Z models. What they have in common is a 14-inch display, the same lightweight chassis and a Core i5-7200U or quicker Core i7-7500U CPU. The X40-D-10H reviewed here is a higher-end option that has the better processor, a SATA SSD and a whopping 16GB of memory. 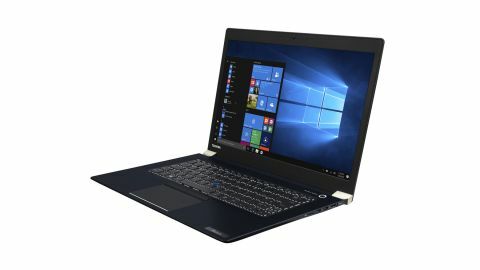 With Dell, HP, Lenovo, Asus, Apple and others all looking to dominate this highly desirable sector, what makes the Toshiba Tecra X40-D-10H special? It’s hard to pinpoint the exact feedback that elicits this response, but the Toshiba Tecra X40-D-10H feels right from the moment you pick it up. This might be to do with the 1.25kg weight, the magnesium casing or the 16.9mm thickness, but this system undoubtedly has poise and the distinct air of being special. Opening the lid reveals a traditional laptop layout in which the space in front of the keyboard is dominated by a centralized touchpad, a SecurePad design with integrated fingerprint reader. The keyboard above is a good size, and benefits from a very positive action and backlighting. The 14-inch, 1080p non-reflective touch panel occupies most of the inner lid, leaving just enough space at the top for an infrared camera with dual mic for Windows Hello and Intel Authenticate, and a conventional webcam. The metal hinge allows the screen to be tilted back to about 45 degrees, but not any further (so there’s no tent or tablet mode here). To demonstrate equivocally that the Tecra X40 is a modern design, Toshiba included a total of three USB ports, of which only one is a conventional Type-A. The other two are USB 3.1 Type-C Gen 2, located on the right side, and using either of these you can connect mains power for recharging the battery. Also on the right are a microSD card slot and a full-size HDMI port, negating the need to use a dock to connect an external monitor. The conventional USB port is on the left, along with a Kensington lock point and a headphone jack. Normally the lack of a LAN port might concern us in a business machine, but that omission can be addressed using the Toshiba Thunderbolt 3 Dock (which costs £200/$200). That particular accessory was kindly included by Toshiba along with the machine for review, and we’ll talk more about it later. The underside of the notebook has no user-friendly access panels. To get inside you’ve got to remove the 12 screws that hold the base on, including a hidden one. Once inside you can upgrade the memory or replace a dead SSD, but doing this may also invalidate your warranty. The review model uses the Core i7-7500U (Kaby Lake), a powerful 2.7GHz dual-core processor with hyper-threading that includes 4MB of L3 cache. The system has 16GB of DDR4 memory installed to ensure smooth running, and a 512GB SATA SSD. As Ultrabooks go, the Tecra utilizes mobile PC technology from 2017 without sacrificing stability or reliability. It’s attractive without trying to grandstand. And, with the possible exception of lacking PCIe connected storage (available in other models), it has more power than most business people will strictly need. Toshiba’s choice of the Core i7-7500U CPU is an interesting one. Many competitors have gone with the even quicker Core i7-7600U, or even the Core i7-7660U. We suspect this decision is about battery life and fan noise, and how a beefier processor would impact negatively in those areas to deliver only a marginally more powerful system. Using the Core i7-7500U also has cost implications that feed into the end user pricing. Dell’s Latitude 7380, for example, uses the 100Hz faster Core i7-7600U, costs about the same price as this Tecra review model, but only has a 13-inch display and a 256GB SSD. In a similar vein, the HP EliteBook x360 G2 with the faster CPU costs £1,919 (around $2,530), and only has a 13.3-inch display, though it also has a reversible hinge (meaning it’s a convertible). The cheapest Tecra X40 machine costs about £1,200 ($999 in the US) and the spec we’ve reviewed here is closer to £1,775 ($1,500). At this level, Toshiba isn’t going to attract many customers who aren’t paying from business coffers. The only part of the review model specification we’d change is the SATA SSD, as Intel’s Kaby Lake technology was built to exploit a PCIe connected storage device. There is a free memory slot inside that could be used to boost system RAM to 32GB, but the flipside of that upgrade could be a loss of battery life keeping all that memory refreshed. Adding elements like face recognition (IR) cameras might make Microsoft happy on some level, providing a use for Windows Hello, but the reality is that most businesses likely won’t use these things. In the coming months, systems using Kaby Lake R will start to become more plentiful, but until those arrive in force, the technology in this Ultrabook is at the higher end of what’s possible for ultra-portable machines.